I didn’t set out to be a writer. I went to university thinking I’d come out with a degree that would allow me to help people. And for a short time it did. But then I got married and had two children and 12-hour shifts were no longer an option. So I took a job as an office administrator and learned book keeping. When I had my third child, I chose to work from home and kept the books for my husband’s restaurants. I’d been artsy all my life. I wrote poetry and short stories in high school but never really considered it writing. It was just a way to express myself. When the kids came along, I spent hours decorating their rooms, finding ways to incorporate whatever theme I’d come up with. I didn’t consider myself creative. I was just having fun. Then we moved to a lovely village outside the city limits, and I found myself at home with a new baby and nothing to do. I was proficient at my bookkeeping and it took up little of my time. So I baked. Again, being creative never crossed my mind. I’d found something I enjoyed doing and I didn’t gain an ounce by sharing with my friends—letting them worry about the calories. Creative? Hey, I needed to stay busy. No stranger to a gym, I learned I could get paid to workout. I became a fitness instructor. I’m known for the inventive ways I torture my members week after week. No creativity here. I’m just a sadist at heart. I then rediscovered romance novels. Karen Marie Moning became one of my favorite authors. On her website, she gave advice on how to become a writer, as did another of my favorites, Sherrilyn Kenyon. Me, a writer? Didn’t you have to go to school? Sure you did. I had friends who’d done just that. But I figured what the heck, and tinkered with a story. Getting published never crossed my mind. Again, this was just for fun, because I wasn’t trained to be a writer. It was my husband who pointed out all the things I didn’t do to be creative. He encouraged me to go for it, to be a writer. I had my own hero and didn’t even realize it. I joined the Romance Writer’s of America in 2007 and my local Canadian chapter shortly after that. In the summer of 2014, one year after I met my editor at the RWA conference in Atlanta, Kensington Publishing offered to publish my Women of Vegas series, and I signed with The Knight Agency. It may have taken me a little while to figure it out, but I am proud and happy to say I am a romance writer. "Shannon would ignore whatever feelings Noah had rekindled. They weren’t real. They were childhood dreams of a life she wished she had." Have you ever had the urge to go back in time to right the wrongs? Have you ever done something so bad, it literally haunts you wherever you go? "Talking to him had been bad enough; seeing him had torn her in two. She’d nearly been dumb enough to throw her arms around him—then he’d arrested her." Shannon has lived her whole life embarrassed of her childhood. Being part of something horrendous, Shannon has never been able to forgive herself when someone important to her dies. Does she have it in her to make amends and rid herself of her past mistakes? Noah lost the one thing that he loved, Shannon. Having to contact her for an important case, he secretly hopes that they can pick up where they left off. But with hurt feelings and empty questions, there are many obstacles for the two former lovers to overcome. "This wasn’t only about fraud; this was about stopping the money laundering of drug lords and, if they got lucky, doing some real damage to their operation. It was just seeing Shannon that had made his resolve slip." 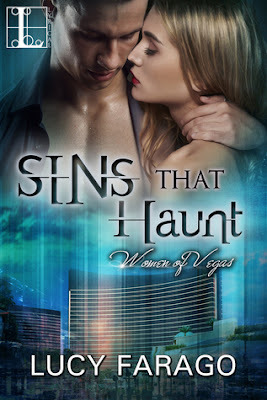 Mixed with sexual chemistry, and action, Sins that Haunt will take you into a world filled with fraud, crime and murder. Lucy writes with determination and with style!